Chris Visco was once a buyer for a major department store. She has taught serial killers how to make lamps, run several political campaigns, and operated a bakery. Now, Visco is Pennsylvania's dominant retailer of medical marijuana. The 47-year-old mother of three is the co-founder and CEO of TerraVida Holistic Centers, a chain of three cannabis dispensaries scattered across the Philadelphia suburbs. "I am the biggest [legal] weed dealer in the state," Visco said, with customary bravado. Her claim is supported by the state's medical marijuana growers. She's also a patient. Visco said cannabis products have been good for her migraines and insomnia. She uses the Pineapple Express strain for her headaches. And each night, an hour before bed, she takes a 10 mg THC capsule that she maintains had increased the number of hours she can sleep from three hours to between five and six. "It's really worked for me," she said. Visco has taken an unorthodox route to the top of the Keystone State's cannabis industry. She presides over an expanding chain — she hopes to open six more spa-like dispensaries next year — and employs nearly 80 people. "Chris understood from the beginning that the marijuana business is, aside from whatever else it might be, a business," said State Sen. Daylin Leach (D., Montgomery). "And as such the basic rules of business apply: Provide a good product, at a reasonable price, and market yourself aggressively. This put her light years ahead of some others who felt that marijuana was magic, and the normal hard work of building a business wasn't necessary." In Las Vegas in mid-November for the MJBizCon, the world's largest marijuana business convention and expo, Visco said she witnessed a whirlwind of consolidation as venture capitalists sought to acquire successful grows and dispensaries throughout the country. "Everyone was buying and selling," said Visco, who entertained and rejected a few offers herself. The number of patients walking through TerraVida's doors may be rising, but Visco said her stores — in Abington, Malvern and Sellersville — may still see lots of red ink this year. The daughter of the late John P. Durante, the Republican sheriff of Montgomery County, Visco admits to smoking "lots of marijuana" back when she was a student at Plymouth Whitemarsh High School and at Drexel University. "I went to a lot of [Grateful] Dead shows," she said. "I was a big smoker when I was a teenager." After studying psychology at Drexel, she was hired at Boscov’s department stores as a gift department manager. She rapidly rose through the ranks and became a star buyer. “I was promoted because I was aggressive and made sure I was always in the right place at the right time.” That became her template. Al Boscov, who TerraVida’s CEO, Chris Visco, considered her business mentor, shown in 2014. Al Boscov became her mentor. The legendary department store king, also a Drexel graduate, now deceased, was Visco's boss for nine years. "He taught me how to be an entrepreneur," said Visco. "He showed me if you were driven and had ambition, you could and would succeed financially." "He'd see me and call out "Here comes Tenacity!,'" said Visco, who says she wants to be "the Al Boscov of cannabis." Visco left Boscov's in 1998. The commute to Reading from the Philadelphia suburbs ate up an hour and a half of every day. "I had to be closer to home and my children." Boscov wrote her a letter before she left. "He said he never expected that I'd go," Visco said. "The letter was very touching. It's the most valuable possession I have." In need of work, she tried to talk her way into David’s Bridal in Conshohocken as an associate buyer for dresses, but CEO Steven Earlbaum created a position for her as an accessories buyer. "If you are a good merchant, you know how to follow trends, read a market and let the market guide you in terms of the products," Visco said. She spent seven years working for David's. In 2004, Visco met an entrepreneur who had landed a government contract for a lighting business. The contract, with the U.S. Department of Justice, was up for renewal. "We hit it off," Visco said. "And for it to be a woman-owned business would give it a leg up." With the partnership forged, the pair won a new contract. The company, called Performance Lighting, imported parts and shipped them to Coleman, Fla., where inmates in the maximum security prison there assembled the components into marketable lamps. "I spent a lot of time behind the walls. I trained serial killers to put together lighting fixtures," Visco said. "A visiting colleague once asked if they were serious criminals, they didn't know. Oh, yes! They were." Visco said she and her partner built the business from $1 million a year in revenues to $10 million. "That's what I do," she said. It was a good run. But with the federal contract set to expire in 2011, Visco again set her eyes on the future. She launched a social media marketing firm from scratch in Conshohocken to promote restaurants. It evolved into the business she'd call PJs & Coffee. Soon, Visco was taking on car dealers and other small businesses. But when her father, Sheriff Durante, died unexpectedly at the age of 60, "there were dozens of people who wanted his job and I knew who he wanted to replace him," Visco said. Republican Eileen Behr, who had been appointed to complete Durante's tenure, won a full term with Visco's social media assistance. Her results caught the attention of the Montgomery County Democratic Party. They brought her on to train candidates. "I was hired by individual Democratic candidates and went 16-0. Most of them were underdogs. Then I had more candidates from Philadelphia who wanted to hire me for contentious primary races." While running PJs & Coffee, Visco learned about 14 merchants at the local farmers market in Flourtown who were being displaced for a new CVS drugstore. She ran a shaming social media campaign pro bono, found a developer to help move the merchants, and then persuaded CVS to pay $50,000 to help the merchants set up in a new building. But when the dust settled, they were missing a bakery. "The cornerstone of a farmers market — which is about one-stop shopping — is a bakery," Visco said. "If you can't get bread, desserts or bagels, you don't have a market. So my business partner and I opened a bakery." At this point, there was still no inkling that Visco's next major reinvention would come with marijuana. Chris Visco, Pennsylvania’s queen of cannabis, took a tour of the iAnthus marijuana grow in North Las Vegas in mid-November. Here she takes an iPhone photo of one of the growing rooms. But she was approached by a field director for one of the political campaigns she had worked on. The field director asked whether Visco would talk to a female client who was exploring the idea of opening a cannabis growing facility. As a favor, Visco reviewed the woman's investor presentation. "She hadn't positioned herself properly. She was going to investor meetings with a huge PowerPoint presentation that had no dollar signs on it," Visco said. "How do you ask for millions without telling people what the expected return on their investment was going to be?" "We agreed we should do it ourselves. We were all retailers," Visco said. "We figured, how hard could it be?" The trio was at Birnbaum's house when Birnbaum's son, searching for results online, screamed out: "You won!" "I fell to the ground and started sobbing," Visco said. "I was elated." "Our application showed we were passionate about our community, passionate about being a good neighbor, passionate about paying our people very well, passionate about helping patients, our outreach and education and diversity," Visco said. Her suppliers said that compassion is a key to her achievement. 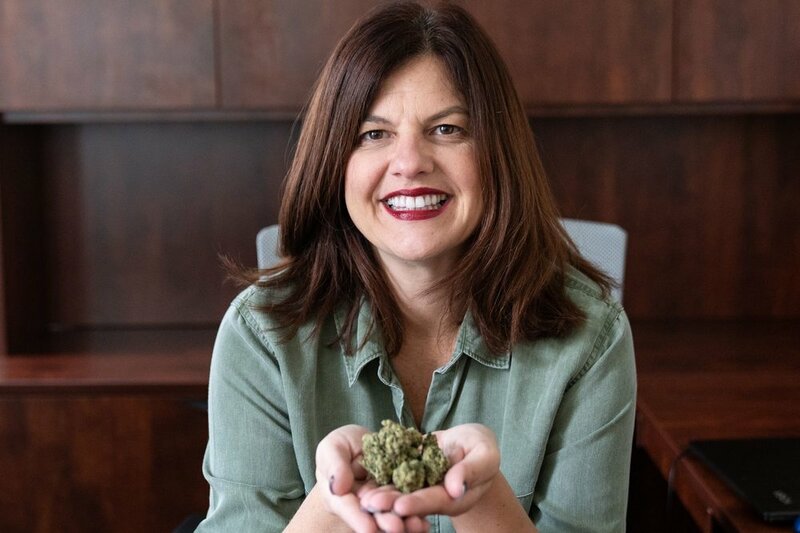 "There's good reason why Chris has been so successful, and it's not just her keen business sense," said Kobi Waldfogel, sales manager for Terrapin Pennsylvania, one of the state's 11 operating cannabis growers. "Chris really cares about her patients' well-being and it shows. You really can't fake that kind of empathy." TerraVida opened the day after Valentine's Day. Visco said she loves the business more than she ever thought she would. Though she's repeatedly approached to sell, Visco said she's not interested. That's a far cry from just about everyone else in the industry. Most have an "exit strategy" — a plan to sell out to venture capitalists, Big Alcohol or Big Tobacco. Visco says she expects the industry to shake out as talk heats up about state and national legalization. But she's planted her stakes and is staying put. "I have no desire to move on. This is what I do. This is who I am now," Visco said. "I'm too emotionally attached to my patients to leave them. Next year, patients are going to need medicine and some [dispensaries] won't be here. I can promise TerraVida will always be there." Which Cannabis Companies are Stepping Up?